At the end of 2009, The Economist published a cover that boosted the ego of all Brazilians. According to the text, our time had arrived and the country would finally take off. But in September last year, the same magazine issued an update about Brazil and there was no good news. “Has Brazil blown it?” the article asked. It was a great disappointment. We have been waiting for such a long time for the chance to show the world our strength. “Brazil is the country of the future”: we have heard since childhood. But this future seems to be always one step ahead of us. Last year, Brazil’s economy grew by 2.3% — a better performance than in 2012, when the economy expanded by only 0.9%, but still so distant from the 7.5% registered in 2010. One of the reasons for this deceleration is a rotten infrastructure. Bottlenecks in different areas restrain the country’s development to some boundaries. The most emblematic example now is the imminent power shortage caused by the lack of rain in a country in which hydropower generates four-fifths of electricity. Brazil has already experienced a serious energy crisis, in 2001/2002, and some measures were taken to avoid a situation that is really a no-brainer formula: no energy equals no growth. A wider range of technologies is needed to cope with variation in rain seasons. There is some effort being put into introducing solar and wind technologies but what seems to be lacking is more fossil fuel technology. The fact is that all measures that have been considered have not been enough. Thanks to the football World Cup that comes to the country this summer, Brazil was forced to spend more in infrastructure, and at a faster pace than ever, over the last few years. Airports, to receive the foreign football fans, were one of the priorities. Wireless broadband access was also an issue. But, despite the investments related to the world’s biggest sport event in the year, the predominant mobile communications technology used by Brazilians is still 2G. 3G services might get the pole-position by the middle of the year, according to Anatel (the Brazilian Agency of Telecommunications), but the prospects for 4G are not the best. The high prices for its use are making the expansion of this technology quite slow. To cope with the higher demand during the World Cup, companies that operate in the country opted to invest in the expansion of WiFi hotspots. It certainly helps, but doesn’t solve the problem. What many investors seem to agree on is that the challenges Brazil faces can be transformed into great opportunities. But yes, you have to be willing to take risks. In many cases, there is a market and people are waiting for better services or products. One example is the spread of taxi mobile applications in Brazil. In a city like São Paulo it can take some time to get a cab on the street and in Rio de Janeiro it can even be dangerous. The young Brazilian entrepreneur Tallis Gomes decided to create the Easy Taxi app after waiting for half an hour for a cab on a rainy night in Rio. Established in 2012, today the company is present in 26 countries, after having received last year US$15m from Rocket Internet-backed Latin America Internet Holding for global expansion. And Easy Taxi is just one of many taxi apps available in Brazil today. In order to be differentiated from competition, some of these apps offer English courses online so the drivers can offer a better service for the tourists during the World Cup. 99Taxis and Safertaxi adopted this strategy in a country where only 5% of the population speaks English, according to a survey conducted by the British Council in 2012. What everybody knows is how much Brazil loves football and President Dilma Rousseff has promised the country will host the “World Cup of World Cups”. But not everybody seems to share the same excitement. In June last year, during the Confederation Cup, the country witnessed massive protests over poor public services, corruption and the high cost of the World Cup. It is difficult to know if the same will happen this year. Brazil’s sports minister, Aldo Rebelo, said that street protests will be very small compared to the ones that shook the country in 2013. But, according to an article published by Reuters in February, the threat might this time be in cyberspace more than in the streets. Brazilian hackers who proclaim themselves members of the international hacker network known as Anonymous are threatening to disturb the big party by attacking official websites and those of companies sponsoring the event. Whatever happens in June and July this year, (and as a Brazilian what I want most is that the country wins its sixth World Cup), is not going to be the end of the story. 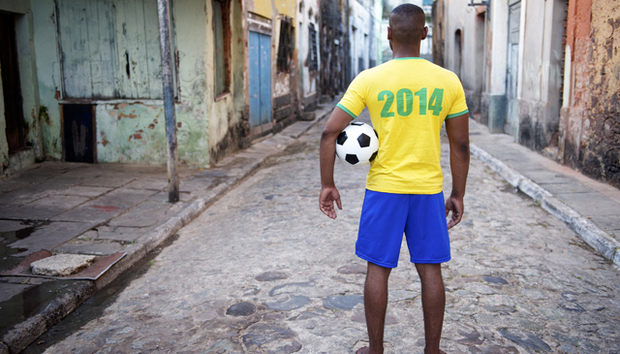 In two years, the world’s eyes are going to be focused in Brazil once again for the Olympic Games in 2016. Hopefully, we will have learned some important lessons by then. « Facebook's Sheryl Sandberg: Dividing Genders?